趙永祥博士學經歷(Dr. Chao)介紹 - 老師留言板 - 趙永祥博士(Dr.Chao Yuang Shiang) 學術論壇(Global Forum) - Powered by Discuz! Education Degree : PH.D in Management, National Yunlin University of Science and Technology, Taiwan, ROC. Position:Assistant Professor, Dep. of Finance and Institute of financial management, College of Management, Nan Hua University, Taiwan, R.O.C. I'm a college teacher for more than 14 years in university. I enjoy myself in doing research and teaching in my academic life. I have taught for over thirteen years in Yu Da University since 1999. Most of my students work in financial institutions,insurance compaies and stock markets. In the meanwhile, I also acted as a financial/strategic consultant in several medium-sized enterprises since March, 2006. I expect that there are two main academic directions to do subsequent research in the future. First of all, hoping to revisit and reevaluate the applicability of existing research to connect theories in light of the changing conditions of global business that might have invalidated their boundary conditions and assumptions. 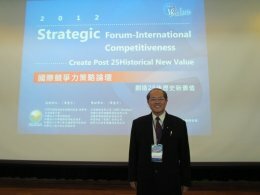 Secondly, I hope to generate novel theoretical ideas and empirical integrated model that better reflect the dynamics of a post-crisis world and provide relevant and timely knowledge to global managers and companies as well as to policy makers, governments, and all other participants in the global economy. 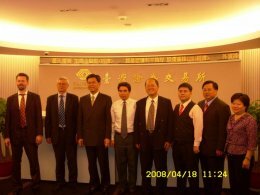 The first book entitled "MNE Investment Strategy and Risk Evaluated in China" has been published on April, 2012(ISBN:978-3-659-10694-1). The crucial findings In this book, we link resource dependence theory to our findings to explain why China investment(CI) plays an important role in foreign diversification, especially in China. When TMNEs extend diversification activities, they can seek opportunities and new market through geographical diversification and can absorb new information and install different knowledge and energy into internal organization to obtain better performance level.We provide some sincere suggestions to decisionmakers and CEOs of MNEs or those TMNEs consider entering into the China market. TMNEs should consider carefully not over-invested in China.MNE should focus on their cored investment fields with moderately middle-level diversification.According to our findings,CI strategy is possibly a better way to gain scope advantages. The most important consideration for MNE decision makers is be careful in the context of change especially china government political policy which is highly changeable from governmental macro-conomic adjustment policy. Furthermore,the inflow and outflow of finance not so flexible to operate will also limit the cash flow allocation efficiency to create better financial performance. have arisen from the newly gained attention to the investor base. 1.Which investor groups hold what exposure to government securities? 2.Is there a link between the investor base and bond pricing? 3.What changes will the current European financial crisis catalyze in thinking about economic development? On the mix of market and state in the economy,it reaffirms the value of not relying blindly on the strengths of either.The crisis showed again that both markets and EU governments/ECB can fail spectacularly,and that while markets must ultimately be the drivers of growth,good government is needed to create the conditions for markets to work well and to reduce volatility and vulnerability.Additionally the global crisis leads to provide new strategic thinking in practical policy especially in EU. The third book entitled "Global Value Chains and Regional Economic Integration Development"
We focus on topics relating to regional cooperation and integration in the areas of infrastructure and software, trade and investment, money and finance, and regional public goods. In our findings, we link resource dependence theory and economic integration model to our findings to explain why China plays an important role in Asian countries, especially in south-eastern Asia. In addition,regional economic integration through logistics,information network and connectivity improvement can increase the virtual size and amount of an economy as trade with neighboring countries increases. This leads to substantial benefits from scale, network, coordination and agglomeration economies. According to our findings, GVCDs and regional integration has captured the imagination of South Asians but the debates on identifying appropriate and effective strategies for securing this objective continue on the better condition in developing beneficial integration economic effects, in addition, we find that China takes the best scores in economic cooperation-and-integration dvelopment in Asian countries. The third book entitled "Global Value Chains and Regional Economic Integration Development " has been published on 5-September, 2013. Up to now, there're totally thirteen textbooks published including six professional financial publications.five local textbooks and two foreign textbook had been published since 2002. I expect to get more good quality papers published in SSCI/SCI high impact factor journals in the coming future. I still make the best of time to move forward and contribute my research to academic community in academic field. 6.Counseling consultant in creating business and career development, The National Youth Commission (NYC), Executive Yuan, R.O.C. (validity: 2012/6/1-2013/5/31). 7. Counseling consultant, Small and Medium Enterprise Administration, Ministry of Economic Affairs, R.O.C. (validity: 2013/4/1- 2014/3/31). 8.Counseling consultant ,the Bureau of Employment and Vocational Training (BEVT) ,Council of Labor Affairs , Executive Yuan, (validity: 2012/3/1-2012/12/31). "Never too late to learn and do your best in doing everything right until you have succeeded in your target” & " Make the best of time to do the thing right " is my life principle.